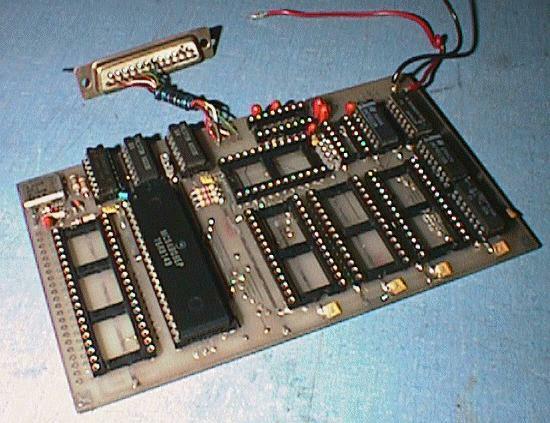 Processor clock, reset, address decoding, baud rate generator. Unfortunately I could never get this thing to work. And somewhere along the way I reversed the power, or put 12V on the board, or something, blowing most of the chips, so, again, this board was sidelined. So, now we come to 2001, where I clean out my shack, rediscover my 6809 computer, and start investigating. Of course, I have learnt a lot over the past 10 years, so this time I don't just plug all the components in and hope it works. First, just the 74HC14 which is the oscillator. No clock. But a replacement 74HCT04 works. So the 74HC14 was one of the casualties... OK, plug in the 74HC73 flip-flop that generates the quadrature clock. And use a scope (did I mention I have better tools available nowadays? :-) to determine that, oops, Q is lagging E (the datasheet shows that Q should lead E) -- Hmmm, that explains why the thing never worked, I checked for clocks but I didn't have a scope then to check for phase. Also, the clock is at 500 kHz instead of 1 MHz. The circuit I used to generate the clocks comes from a pretty official looking document ("Motorola Microcomputers M6809 Course Outline") which is dead wrong. (The schematic in the 6809E datasheet is right, but obviously I did not have a copy of that available at the time). 114k GIF schematic of the clock generator and address decoding (How NOT to do it :-). As you can see from the schematic, the address decoding is, well, to say the least, interesting. This would of course have been a lot easier with a PAL, but I didn't have access to the PAL tools at the time. A15 selects the bottom 32K block of RAM. As such, there is always RAM from $0000 to $7FFF. U6, an eight input NAND gate, maps the top 256 bytes of address space ($FF00-$FFFF) as I/O space, which is further decoded by a 74LS138 to form 8 blocks of 32 bytes each. The top one of these blocks always selects the ROM, so there is always ROM mapped from $FFE0-$FFFF. Now for the tricky bit... depending on the state of an output pin from the VIA, the rest of memory ($8000-$FEFF) will be either RAM or ROM. The idea is, of course, to boot from ROM and to then map the ROM out and the RAM in. 2002-09-16: It lives! I replaced most of the chips (RAM and ACIA was fine, 6809 was blown though) and put a scope on the address and data lines, alright! Well, that worked as expected. Plugged in the ACIA and an EPROM with DEBUG09 which I had edited way-back-when to sit at $F000-$F7FF and to use "my" ACIA address, and hey, I get characters coming out of the ACIA. Looks promising, except that the ACIA continuously sends NULLs. (It does look as if it's sending the startup message first, though). 2002-09-17: Live and learn. The AVMA signal on the 6809E is not the same as the VMA signal on 6800 machines. So address decoding circuits should not use it to determine when a memory access is valid (basically, it halves the time available for the peripheral or memory to respond to the access cycle). I tied pin 6 of the 74LS138 high, and things are looking up. To generate the ACIA clocks, I divided the 4MHz clock by 13, and then by 2, 4, 8 and 16 to get 9600, 4800, 2400 and 1200 baud (16x divider in the ACIA). Well, the circuit I used does not work. I used a 74LS393 ripple counter, with a three input AND gate to reset the counter when a count of "1101" is reached. In theory, this should work. In practice, the 74LS393 is a ripple counter, meaning that the outputs don't all change state at the same time, meaning that strange things can, and do, happen. A synchronous counter would have worked fine. So would using a presettable counter like the 74LS161 counting up from 3 (connect load to carry via an inverter). The infamous Motorola Microcomputers MC6809 Course Outline with the incorrect 6809E clock schematic (caution, 3 meg file).